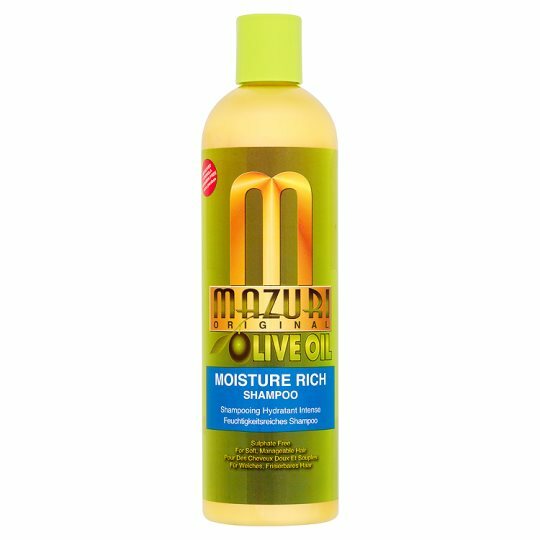 Enjoy the feel of healthy clean hair with Mazuri Olive Oil Moisture Rich Shampoo, paraben free and blended with vitamins and oils (Soybean, Safflower, Olive) to restore moisture and nourish your hair. For relaxed, naturally curly or colour treated hair. For best results wash and condition your hair weekly. Apply to hands and massage gently through the hair before rinsing with warm water. CAUTION: FOR EXTERNAL USE ON HAIR ONLY - AVOID CONTACT WITH EYES - KEEP AWAY FROM YOUNG CHILDREN.